It was about nine in the morning. The student group I was traveling with had just landed at Keflavik International Airport in Iceland. I hadn’t lost any luggage. I had managed to sleep a lot on the plane so I wasn’t that tired. Other than the fact that our flight had been delayed because of a storm in New York and we arrived three hours late, so far the trip appeared to be running quite smoothly. That was until our group boarded our bus. While we were rolling along, I opened my backpack and then realized something. After searching desperately, I came to the conclusion that I had left my eye mask on the plane! You must think after reading this that I am a total drama queen who freaks out over the smallest things in life. I would agree with you if this were in any other part of the world. But when you’re in Iceland in the summer, an eye mask is your best friend, because of the fact that…well the sun is shining almost 24 hours a day. Despite the fact that nearly all the places we stayed at during the trip were able to effectively block out most of the light with dark curtains, the sun’s rays still managed to peek through, making sleep quite difficult. But within a few days of the trip, I realized that constant brightness was just one of many things in Iceland that makes it another world. Starting off with the cold, most people know that despite their names, Greenland is actually icier than Iceland, and Iceland is considerably greener. But that doesn’t mean that Iceland is completely lacking in ice. In fact, it has a lot of ice, with glaciers and ice caps covering over 11% of the country. My group actually had the opportunity to hike on a glacier, which turned out to be quite the expedition. When I first saw the crampons, the axes, and the glacier itself, I wondered if I’d make it out alive. Well, obviously I did and it was worth every frightening step. Just as challenging as hiking on these behemoths is trying to pronounce them. One ice cap in particular is Eyjafjallajökull. It’s practically impossible for non-Icelandic speakers to string these odd syllables together. That said, you’re close enough if you just say “I love falafel.” But it’s known for more than its name. It’s the ice cap that covers the volcano that in April of 2010 erupted and disrupted air travel for much of the world for almost a week. Speaking of volcanoes, not only is Iceland very cold, but it’s very hot as well. 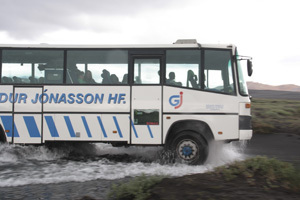 During the trip, our group visited several geyser parks. It was so amazing to see these areas in the ground shooting boiling water high into the air. It was like the earth had a mind of its own. Iceland sits on hot water and you can see signs of it everywhere—steam, boiling mud pots, and other thermal features. It’s a geologist’s dream. It’s also a photographer’s dream, which is why I was there. 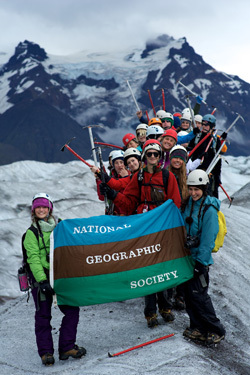 I was one of 26 high school students on a National Geographic Student Expedition. 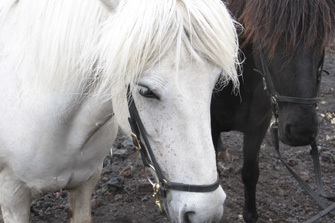 For two weeks, we explored this extraordinary country—seeing waterfalls, riding Icelandic ponies, even touring a fish -packing company (and much more). Some of us were focusing (literally) on taking pictures while others were there to expand their knowledge of geology and some were concentrating on filmmaking. 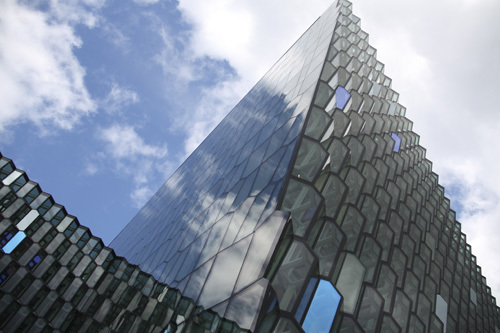 While there we also spent some time in Reykjavik, which is filled with intriguing buildings including Harpa, the city’s concert hall (which is pictured above) as well as 60% of the Icelandic population. After a couple of days taking photographs in the streets, I felt I knew my way around. From the constant sun to the fire and ice, one can’t deny that despite its small size, Iceland has got to be one of the most varied places in the world. I did get to buy an eye mask early on in the trip, but I barely used it, for my eyes were open the entire trip to Iceland’s endless possibilities. Justine Seligson, our teen columnist and photographer, is a sophomore in high school. 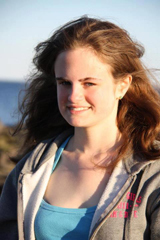 Justine started her Just-Teens Travel column providing teen insights, ideas and advice for students (and their parents) when she was in 7th grade. At 14 years old, Justine won the Cynthia Mullins Award in Youth Photography at the Annual Juried Student Exhibition at Silvermine School of Art in New Canaan, CT. She has also been published on National Geographic's Intelligent Travel blog. See her piece here. If you would like to suggest topics--or contribute a teen travel piece--e-mail Justine. Not planning a trip right now? Sign up for our e-letter (top of this sidebar). Once a month, we keep you posted on our new stories and savings. Sea Lions, Tortoises and Iguanas...Oh My!